Because of our knowledge, experience and buying power, using a destination management company is beneficial in more than one way. We’d like to explain to you how using our services works to your advantage. A handful of reasons why using the services of a destination management company for your event, incentive, meeting or congress is beneficial to you. A Destination Management Company is a company that specialises in the organisation and logistics of meetings and events in a specific country. With their wide knowledge of the field, their many years of experience in organising programmes, and their creativity – a DMCs role is to provide a ‘customised’ event for your client . No matter what the event or the occasion, Destination Management Companies will always find an exciting and tailor-made solution. They are the local partner of the outgoing travel agent. Besides organising meetings, incentives and events, a company offering Destination Management will also provide special services which include catering, excursions, activities and entertainment, accomodation, transportation of any kind and provide travel management, guides and hostesses. Offering a comprehensive range of services and products that are essential for the creation of successful congresses, corporate meetings, exhibitions and special events of any size. Other services offered also include concept and design, project management, production, graphics and decoration, installation and dismantling and warehousing. They can also provide anything from electrical services, exhibitor furniture and branding and also gifts and corporate imaging bearing the name or logo of the company. Experienced DMCs provide a Return on Investment (ROI) to clients with clear event goals and objectives. A qualified DMC can coordinate available venues, area attractions and destination resources required to meet your requirements and ensure a successful programme saving you both time and money in research, negotiations, planning and due diligence. A good DMC also provides added value through connections, preferential services and peace of mind. Destination Management Companies remain behind the scenes while ensuring that everything runs smoothly and according to plan. A DMCs objective is to provide expert advice and reliable solutions for their Clients. Understanding the aims of their clients leads to more effective planning. 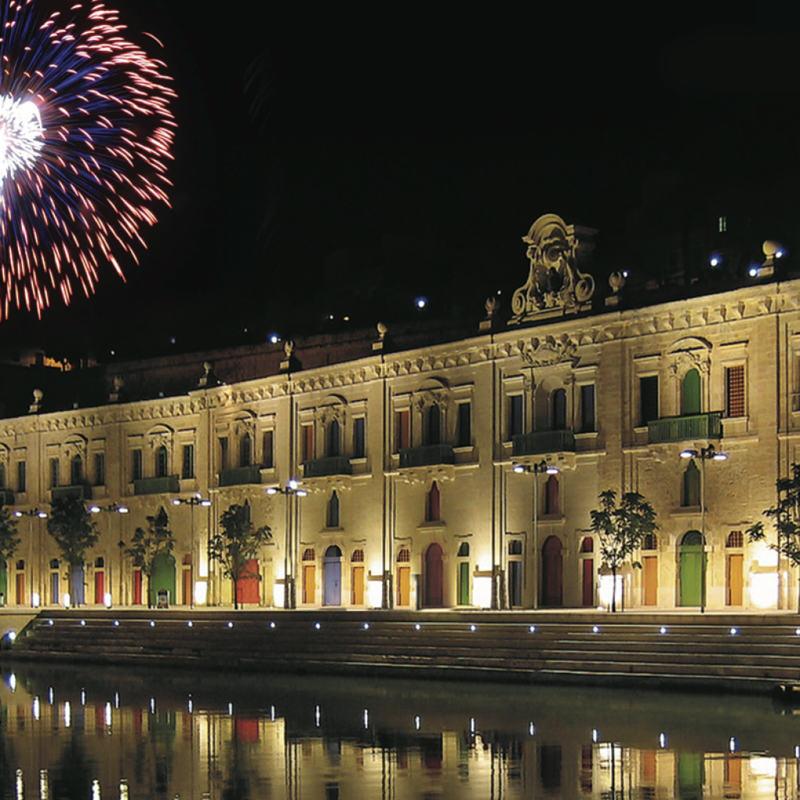 Malta, a group of three small islands at the very centre of the Mediterranean – only 95 kilometres south of Sicily – has been attracting conference and incentive groups for years and a great variety of other visitors for centuries. What makes the perfect conference and incentive destination? Malta, at the crossroads of the Mediterranean, is replete with history and colour. Blessed with year-round sunshine and a temperate climate, it is a popular, friendly destination. It is also possible to enjoy a variety of outdoor activities such as golf, tennis, and cycling. Water sports enthusiasts will find all they need: swimming, wind surfing, water skiing, scuba diving and sailing. Trekking and walks around the Maltese countryside in winter provide a glimpse of the islands’ innate beauty. Maltese festa, a combination of religious festivity and popular celebration, are colourful and spectacular events that should not be missed. The Maltese archipelago consists of three inhabited islands: Malta, Gozo, and Comino and two other uninhabited islands. They lie in the centre of the Mediterranean Sea, 95 kilometres south of Sicily and 288 kilometres north of Africa. The total area is 316 square kilometres (Malta – 246; Gozo – 67; Comino – 3). Malta has neither mountains nor rivers. Characterised by a series of low hills with terraced fields on their slopes, Malta’s coastline has harbours, bays, creeks, sandy and rocky beaches and coves. There are 137 square kilometres of shoreline. The longest distance in Malta, from the south-east to the north-west, is 27 kilometres, and the widest distance is 14 kilometres in an east-westerly direction. Gozo, the island of the nymph Calypso, is smaller than its sister island Malta. The countryside is greener, more spectacular and has a distinct character. Flat-topped hills dot the landscape, while the coast has rugged cliffs penetrated by steep valleys and beautiful bays. More rustic and quieter than Malta, it is 14 kilometres long and 7 kilometres at its widest point. The smallest island, Comino, is home to a handful of farmers. Neither cars nor noisy activities disturb the peace. The many bays and rocky coves in Comino, plus its crystal clear water, are ideal for watersports such as snorkelling and diving. There is a regular ferry service to Comino. There is no fog, snow or frost in Malta. There is an average rainfall of 51 centimetres annually. Sunshine averages 6.46 hours in winter and 10.11 hours in summer. The hottest period is July to September. Nights are regularly tempered by cool sea breezes. Malta is one hour ahead of GMT.